San José State University was founded in 1857 as Minns’ Evening Normal School, and is the oldest public school of higher education in the state. The College of Business was established in 1928, and in 1949 the Master’s Degree in Business Education was introduced. The school was accredited by the AACSB International in 1967. The Donald and Sally Lucas Graduate School of Business was officially named in 2006, thanks to a generous gift from San Jose State University alumni, Donald and Sally Lucas. 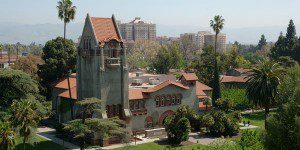 Located in the San Francisco Bay Area, centered in the heart of San José and Silicon Valley, San Jose State University provides a wealth of employment opportunities in the thriving technology and business regions surrounding the campus. The Lucas Business Complex, located just off the South bay Freeway in Santa Clara, also offers courses for students enrolled in the accelerated MBA program. Both campus locations serve as a dynamic hub for transportation, commerce and industry. The main campus is just five miles away from the Mineta San José International Airport. The Business Tower is home to the College of Business administration and faculty offices. The 9-floor Business Tower is a high-rise building on the north-eastern border of campus. Business classrooms are located in the adjacent Boccardo Business Classroom building, a 3-story, L-shaped structure with a below-ground courtyard. A 13,488 square foot state of the art facility is located off-site at 180 Rose Orchard Way, San Jose to house all off campus graduate courses. Students in the MBA for Professionals and MS Taxation programs meet at Lucas Business Complex located at 2933 Bunker Hill Lane, Suite 120 in Santa Clara. This facility is located close to the nearby Levi’s Stadium, home of the San Francisco 49ers. The College of Business employs over 150 faculty members. Around 90 are full-time, either tenured, probationary, or temporary, and around 60 are considered part-time. Guest lecturers from a wide range of backgrounds— top executives of multinational Silicon Valley firms, founders of successful startups, lifelong entrepreneurs, angel and venture capital investors, and other professionals from every area of corporate life—are frequently invited to participate in the MBA programs. Lucas Graduate School of Business faculty members have outstanding academic credentials obtained from top-tier national and international universities and in addition possess priceless business skills gained from experience in global business activities, research, and professional travel. Over 5,000 students are enrolled in the Lucas Graduate School of Business and account for around 18 percent of the total SJSU student body. In total, San Jose State enrolls nearly 33,000 students. San Jose State University offers full-time, part-time and accelerated MBA programs (known, collectively, as the Early Career MBA) as well as a MBA For Professional program.